Digitally Modulated Screening from Hamillroad Software Ltd.
Auraia 6 Screening, so named after the Greek word for beautiful - ωραίος - is the third release of Hamillroad's second generation “Digitally Modulated” or DM screening. Auraia 6 perfects stochastic screening as it not only achieves the high level of image detail long associated with FM stochastic screening, but also produces ultra-smooth flat tints that are as smooth as (or usually smoother than) AM conventional screening. Taking advantage of the immense computing power now available, DM screening is so named because it digitally modulates each and every pixel it produces, precisely controlling not only the dots in each separation, but also between the separations so as to completely eliminate noise. It does this through the use of a "stochastic rosette", which interleaves the screens in all the separations. By doing so, it eliminates noise (and moiré). The "stochastic rosette" also maximizes the amount of ink-on-paper and minimizes the amount of ink-on-ink, which expands the available color gamut whilst eliminating color shifts on misregistration. 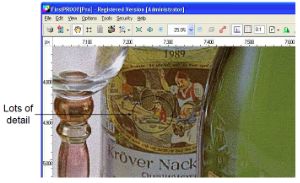 The screening analyzes each pixel it produces to ensure that no dot is too small to plate or print, no ‘non-dot’ is too small to fill-in and no dot or ‘non-dot’ is too large so as to be visible. Dots are created in a carefully controlled manner, to ensure detail is placed exactly where it is needed, vignettes are smooth and flat tints are, well ‘flat’. It cleverly modulates each pixel based on a deep understanding of laser optics, plate technology, printing press behavior and ink flow to ensure that dot gain is eliminated, resulting in the complete removal of patterning artifacts and graininess. Comparison of Auraia DM Screening, FM Stochastic Screening, AM Rational Screening, XM Cross Modulated Screening and CS Concentric Screening. The result of this is a quality of print, especially on violet devices, that was previously unachievable. Based on years of research and experience, the patent pending screening represents a fundamental change in the expectation a printer should have on the quality of print that is achievable. No longer are printers restricted by issues with moiré, reregistration, rosette drift, color shifts, banding, dot gain, dot loss, shadow loss, etc... but they are free to do what they do best - print ‘beautiful’ pages. Other CtP devices are currently being tested / qualified and will be added to this list shortly.